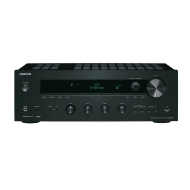 alaTest ha raccolto ed analizzato 848 recensioni su Onkyo TX-8050. La media della valutazione per questo prodotto è 4.0/5, confrontata con la media della valutazione di 4.7/5 per altri prodotti. Gli utenti sono impressionati da design e dimensione. In aggiunta, affidabilità e prezzo ottengono buoni commenti. Abbiamo analizzato differenti valutazioni di esperti ed utenti, età del prodotto ed altri elementi. A confronto con altri prodotti, Onkyo TX-8050 ha ottenuto un alaScore™ complessivo di 88/100 = qualità Molto buono. Stereo-Receiver haben normalerweise nur analoge Toneingänge. Doch der Onkyo TX-8050 versteht sich auch mit digitalen Zuspielern und empfängt sogar Internetradio. Netzwerk Stereo-Receiver mit einer Leistung von 2 x 130 Watt. Neben USB-Anschluss verfügt der Reciever auch über einen LAN-Anschluss, um ihn ins Netzwerk zu integrieren. De Onkyo TX-8050 is een heel aparte stereoreceiver. Niet alleen beschikt deze betaalbare machine over analoge en digitale ingangen, hij bevat ook een netwerkspeler en een onlineluik met Spotify-ondersteuning. No HDMI, but I knew that before hand...just read the specifications people!! Great sound, lots of useful features, simple to set up and use, plays very loud without distortion. The network and USB features all work very well. Build quality is excellent, very solid and heavy. Did I mention that it sounds fantastic? This was my first experience with Onkyo. It will probably be my last. Fit a niche need for my home network. Newegg's service as always was superb. Motherboard failure after 2.5 years of ownership. The cost of repair from the authorized Onkyo Service Center is more than purchasing a new unit under full warranty.